Activating God&#39;s Power in Beth: Overcome and be transformed by accessing God&#39;s power. Do you want to pray with power... and see results? 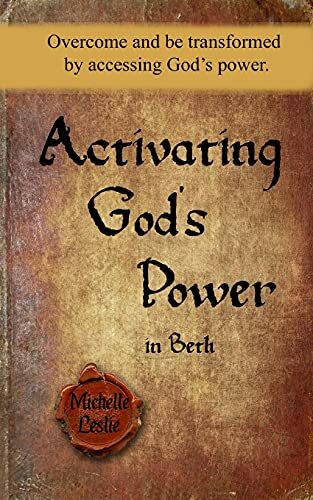 Readers of Activating God&#x2019;s Power by Michelle Leslie will learn what to pray and to confidently claim answers to prayer. This personalized book is a guide to praying according to God's Word! You will discover hundreds of Scripture-based prayers for all of life&#x2019;s situations: from finding your identity in Christ, to awakening God&#x2019;s favor in your life, to overcoming the trials of life with spiritual warfare. When we meditate on the word and speak it, we are activating God&#x2019;s power. God&#x2019;s word brings life and creates a spiritual mindset that changes us and the world around us (Romans 12:2). As you put these mighty, scriptural prayers to work in your own life and in the lives of those around you, you will see God moving and activating his Word. You no longer need to feel helpless in the face of difficult or painful circumstances. You no longer need to miss God's blessings for you and your loved ones. You can pray with power! Nothing is more powerful than God. With Activating God&#x2019;s Power we are praying God's Word to overcome and bring us the freedom only found in Christ. Activating God&#x2019;s Power is a must-read for anyone who wants to pray with strength and purpose. The faith produced from this book will lead to results, not just for ourselves but for the lives around us.